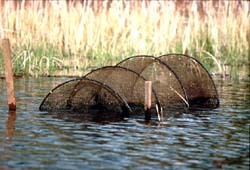 Hoop nets are used to capture turtles in shallow wetlands. (Photo by C. D. Hall). document new locations of rare species and animal aggregations. document new county and state records for animals. better understand the current distribution and abundance of animals in the state. Prior to conducting field surveys for rare animals and animal aggregations in a particular county or region, information is reviewed about the landscape and the animals that may be present. Some of the sources consulted are museum and historical records of rare animals and animal aggregations, satellite imagery, aerial photos, soil and topographic maps, and recommendations from MBS plant ecologists and land managers. Based on review of existing information, the rare animals and animal aggregations likely to be present in the county or ecological unit are identified. Sites that appear to contain areas of preferred habitat for the targeted animals and animal aggregations are identified and ground reconnaissance is done to determine the suitability of the sites. All records of rare animals are entered into the Rare Features Database of the Natural Heritage Information System. Voucher specimens receive final curation and are deposited into the J. F. Bell Museum of Natural History, University of Minnesota. Other information about sites and survey activities are entered into the MBS Site Database. Zoologists prepare or contribute information to site evaluations of sites important to rare animals and animal aggregations. These site evaluations are used to guide conservation activity, such as special management to protect the rare species and native plant communities, or acquisition as a park or natural area.